By now management sim fans should be familiar with the drill – out of the blue a new Kairosoft game is launched, bringing its distinct gameplay style to a new theme. 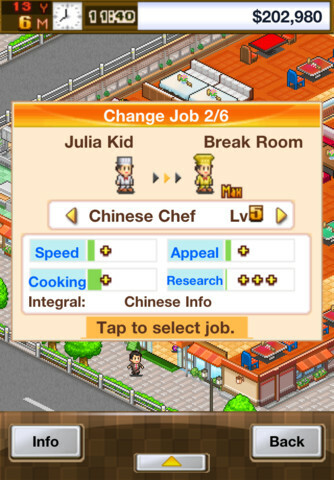 In this case, Cafeteria Nipponica ($4.99) takes a turn at giving players the opportunity to become masters of food service management. The theme is a welcome addition and works well with the management tools it offers. In fact, it may work a little too well, as Nipponica ends up being one of the deepest Kairosoft games on the platform, sacrificing some accessibility for depth. 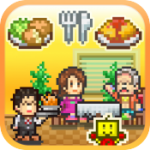 Cafeteria Nipponica puts you in the role of a manager of a restaurant. You hire cooks and servers, set the dishes, and watch as patrons start flocking to your café. Soon after, you unlock the ability to initiate plans for your restaurant, that range from publicity moves (such as running a mobile phone campaign) that encourage business to expanding your restaurant to even being able to move it to a bigger town (bigger population means more possible customers). Meanwhile, you can challenge your chefs with improving dishes by night through combining them with new ingredients, which can either be bought or found on occasional ‘ingredient walks.’ Workers can also gain levels and improve to different job categories, which increase attributes such as speed for servers and research for chefs. If all this isn’t enough, Cafeteria Nipponica ups the ante of micromanagement by eventually allowing you to run three different restaurants simultaneously, each with their own plans, employees, and selection of dishes. The wealth of management is pretty intense in Cafeteria Nipponica and definitely holds its own in terms of depth. Like most Kairosoft games, Nipponica starts off pretty slow. In fact, Nipponica feels a lot slower than other titles, with the gameplay not necessarily opening up until the third or fourth year of running your business. This is exacerbated by the fact that Nipponica is one of the tougher titles to grasp, with a wide variety of ingredients, food attributes, and employees to run with their respective skills and traits. For example, each dish has 8 different attributes ranging from healthy to aroma to even rarity. 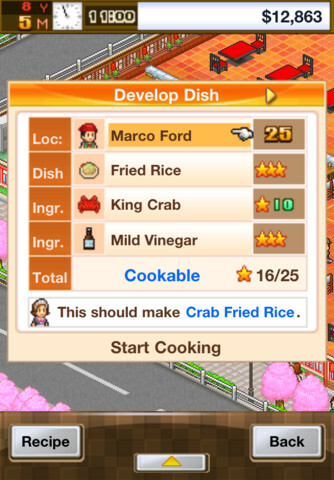 Each ingredient that you can use to develop dishes also affects those attributes, but the game doesn’t necessarily tell you outright how they are affected. In addition, each ingredient has a compatibility rating with dishes, increasing (or decreasing) the chance of substantial upgrades during research. As you can imagine, this leads to a lot of trial and error at the onset of games until you master ingredients and dishes (or if you just go find a wiki). Still, for gamers that appreciated the deeper titles from Kairosoft, Nipponica is an absolute beast. As mentioned above, one area that I feel Cafeteria Nipponica differs somewhat is in its pacing. The game feels a lot slower than previous titles, most likely because there are not a lot of different things actually occurring during a day. Sure, you can launch business plans and explore ingredients, but those are contingent on having ample cash, which is somewhat rare in the first half decade of play. As indicated above, there’s obviously a lot going on behind the scenes, but Nipponica doesn’t necessarily do a good job of bringing it out to the player, leading to a lot of possible waiting. 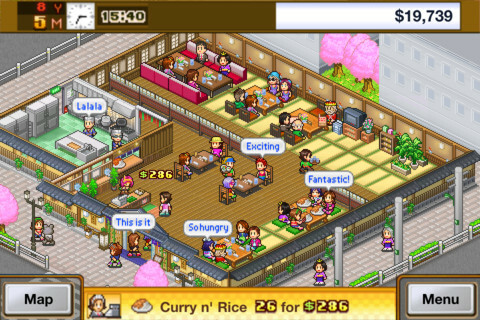 Visually, Cafeteria Nipponica employs a style very similar to previous Kairosoft games, with bright pixelated art and controls that obviously have their backing from older mobile devices that didn’t necessarily feature touch screens. One interesting feature is the fact that Nipponica is universal at the start, with nice retina-enabled text on all compatible devices. Of course, it does little to change the actual graphics, but nice touches like that are an improvement over previous launches. In some ways, the sheer depth of Cafeteria Nipponica acts as both a blessing and a curse. 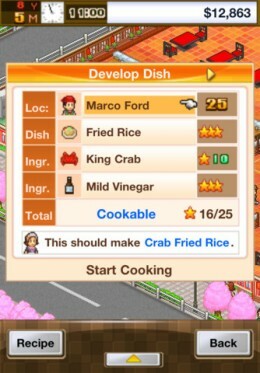 As far as Kairosoft games are concerned, this is one of the tougher titles in its library – particularly for newcomers to the genre. However, it’s also one of the most rewarding titles with a wealth of options and avenues available to make your restaurants successful in your own way (even if it doesn’t necessarily show it on screen all the time). Regardless, it’s a welcome addition to the growing library of management sims and one that is a must-try for established fans of Kairosoft.